• Crown angulation. 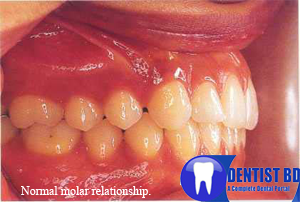 Gingival aspect of the long axis of each crown lies distal to its occlusal aspect. • Crown inclination. The gingival aspect of the labial surface of the crown of 21112 li es palatal to the incisal aspect. Otherwise, the gingival aspect of the labial or buccal surface of the crowns of all other teeth lies labial or buccal to the incisal/occlusal aspect. • Flat or mildly increased (<_1.5mm) curve of Spee. Functional occlusal relations .